The North Carolina Coastal Federation’s annual Hatteras Island Oyster Roast this Saturday, Feb. 3, will celebrate local seafood and a healthy coast while supporting environmental restoration. The roast will take place from 1 to 4 p.m. at Oden’s Dock in Hatteras village. 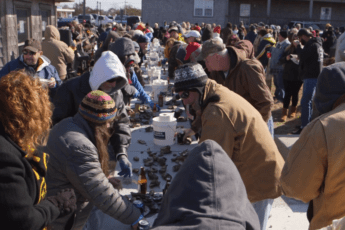 “The Hatteras Island Oyster Roast has become the premier winter event on the island, bringing friends, neighbors and visitors together to support the Coastal Federation in their important work to preserve our waters and their bounty,” said Lynne Foster, who organizes Day at the Docks and the Blessing of the Fleet each year. “Come out and enjoy steaming Hatteras-style clam chowder, cornbread and, of course, an abundance of local oysters whose shells will later be used to build valuable oyster reefs in the sound,” Foster said. The event also features live music by Blurky’s Quirky Friends, and it is sponsored by the Outer Banks Visitors Bureau and City Beverage Co. The radio station 94.5 Water Country will do a live broadcast from noon to 2 p.m.
Advance tickets for $25 can be purchased online at the federation’s Wanchese office or at Oden’s Dock. Admission at the door will be $30.